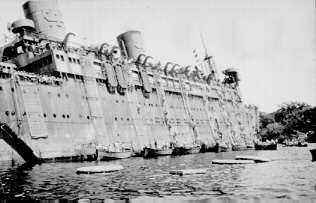 Michael McFadyen's Scuba Diving - SS President Coolidge - Last Day fLieutenant C. Craig Hosmer, US Navy Reserve, was in charge of the Armed Guard Unit assigned to the SS President Coolidge. Armed Guards were responsible for manning the ship's guns as well as providing security for the ship when in port. 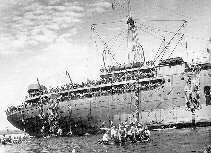 Each day on the voyage from when he boarded the ship in San Francisco on 28 September 1942 until 24 November 1942 when he was back in Noumea, New Caledonia after the sinking, he kept a diary. This diary is entitled "Armed Guard Unit Log Book - S.S.President Coolidge". The following is a word for word transcript of Lt Hosmer's log entries for Monday 26 October 1942, the day the Coolidge sank. This day's report was written up on the morning of 27 October 1942. Lt Hosmer states that while the times are guesses, they are fairly accurate, although his watch may have been one minute fast. The times underlined are said to be accurate to a minute. Note that I have expanded Lt Hosmer's abbreviations and corrected spelling errors. Where I could not decipher his handwriting or did not understand what was written or thought further clarification was needed, I have commented on this. 0420 General quarters condition 1. 0500 Passing between two islands. Men being kept at general quarters in this area. 0615 1st Division sent to breakfast. 0635 2nd Division sent to breakfast. 0645 3rd Division sent to breakfast. 0739 Vessel sighted bearing 345 distance about 10 miles. Guns manned and tracking commenced. Extreme range scale 94. 0750 Vessel ascertained to be on approaching course. 0802 Vessel ascertained to be friendly. Range 6800 [yards] scale 90 tracking continued for practice of xxxx and trainees. Commander of crew on lookout. 0848 Small craft sighted in cover of island bearing about 340. Guns trained on. Range extreme scale 49 [?]. 0858 Vessel signals as from battle group. Signal Officer cannot decipher. Ask meaning. 0902 Vessel says means same as merchant ship challenge. Identification made. Vessel appears to be P.C. or converted destroyer. Too distant to tell. Very black smoke coming from her. Cease tracking,. 0906 Standing into channel. Several ships visible. Appear to be a cruiser and several auxiliaries and merchant men. Uncock guns. Secure all ready boxes with one dog. 0925 Instruct all AG [Armed Guards] and Army on watch at general quarters to stand at ease. One foot from sides of tubs, spaced evenly. 0928 Received challenge from cruiser. 0930:30 Another explosion - mines! Ship shaken badly. Port list commences. Instruct gun 1 to send man to flood forward magazine if any sign of fire and report. Instruct gun 5 to do same as regards the after magazine. Master maneuvering ship to starboard to beach her. List increasing to port. All stations report no casualties. 0935 Bow of vessel strikes coral bottom about 100 yards from shore. Nets have been lowered. Life boats lowering. Abandoning of ship by troops commences. The Coolidge shortly after running aground. 0936 List to port now about 8°. Much oil on water. Most abandoning being done from starboard side. Some oil soaked casualties getting up on Sun Deck from engine room hatches. 0938 Secure Army Officers on watch with instructions to go to their abandon ship stations if possible. Secure all Army enlisted men on gun watch with instructions to abandon ship in orderly fashion. 0940 Abandon ship continues orderly. No panic. Rescue boats can be seen proceeding up the bay from other ships and shore stations. All troops so far are getting into life boats - then taken close enough to shore to wade in and life boats returning for more. Much oil on water making things very messy. Gun 5 reports soldiers struggling in water. Order man sent for same if necessary. [Seaman Second Class Jack] Rhodes is manning phones with me here on the signal bridge. Communications uninterrupted. 0945 List about 10°. It is becoming apparent that the ship will heel over and slide off the coral reef. Gun 5 reports stern going down fairly fast. Send 1st Division to cabins to secure partial pay cards and what valuables they can carry. 0950 Send 2nd Division for partial pay cards and valuables. 0955 Send 3rd Division for partial pay cards and valuables. I go to my cabin and secure various papers and publications , [the rest of this entry is crossed out] 3 khaki shirts, 3 khaki trousers, shaving gear, valuables etc. 1000 Order men out of sky guns [these are the anti-aircraft guns] to starboard side of bridge. Guns 3, 4 and 5 ordered to abandon ship. List 14° to port. 1010 Guns 1 and 2 ordered to abandon ship in orderly fashion. Signal gang except [Seaman First Class Arthur] Trumbur ordered to abandon. Mr [Ensign Doren] Weinstein, Trumbur, Rhodes and myself now left up on the signal bridge. Papers and publications of Mr Weinstein and myself entrusted to [xxxx Second Class Robert] McColl. All Armed Guard and communication personnel instructed to get together on beach and report to Naval Headquarters. I go back along Sun Deck and instruct remaining soldiers etc to abandon ship in orderly fashion. Secure some boxes of ammunition so they won't slide down and explode. Check that all sky doors are closed on starboard side so ammunition won't go out. Obtain Armed Guard insignias from armory. List about 16°. Have been checking inclinometer in chart room. 1012 Soldiers have been waiting at bottoms of nets for life boats to take them in where they can wade ashore. List increasing. Many soldiers still on deck as nets are full. I start ordering men at bottoms of nets to jump into water and swim ashore. She can't stay up too much longer. Ask Colonel [Dinsmore] Alter [US Coast Artillery - in charge of the passengers on the ship] on forward deck to give such order there. All soldiers have on life preservers. 1016 Am moving aft along the Boat Deck ordering men to jump. Water is oily. Nets about 10 feet or more above water. Many seem afraid to jump. Keep exhorting them to kick men in face to get them off. List about 18.5°. 1045 Finish getting idea over. Am at aft end of Boat Deck. Footing very precarious due to the extreme list. Last of soldiers now on nets and starting down. Decks apparently cleared. [Next entry crossed out in diary] Start forward now, hand over hand along [I cannot read next bit] and walking in angles of the scuppers. 1047 Reach vicinity of bridge. Mr Weinstein tells me he send [sent] Rhodes over [the] side to save a drowning man - one of the merchant marine. Weinstein, Trumbur, Chief Officer and couple more of deck and engine room officers around. Chief Officer tells us to get over side while we can. We are all balancing ourselves in the scuppers of the Boat Deck. Angle of deck so steep Chief Mate had to be pulled up here. We start down the net. They are quite slippery by now, but list is great enough that we can more or less walk down the side by using hand lines to steady. Nets stop about 15 feet from water. Go down hand over hand along undersides of ship on hand line for rest of way. 1049 Reach ship's motor boat. There has been no particular thrill or excitement so far. Everyone is calm and doing the logical things. The Captain [Nelson] is already aboard this boat. Am being helped aboard. Very slippery due to oil. Am in bow of the boat. The anti rolling fins are now out of the water. Someone uses them to step aboard. Mr Weinstein about 3/4 of the way down. Sees helpless Philippino man on metal ladder about 3 or 4 feet from net. Man's arm is apparently broken. Mr Weinstein jumps to the ladder and carries man down to the boat. We help them aboard. 1052 Mr Olson, one of the junior mates, appears on the side of the ship from somewhere. There are also visible two men trying to pull someone up out of the passenger doors about 2/3 way aft. Olson runs along sides of ship, reaches them and starts to help. Ship is slowing beginning to slide into deep water. 1050:30 Ship gives a great lurch. Begins to slide rapidly backwards into deep water. We are now about 50 feet from her. See Olson and the two others dive into water. 1053 Ship disappears beneath the oil and water. Tremendous waves, air bubbles, swirling water and oil. 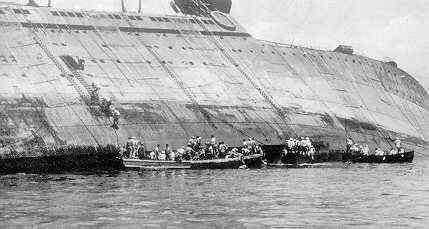 A large self propelled barge was trying to reach those on the side of the ship. It spins around out of control, is drawn to where the men are and apparently runs some of them down. Too much happening at once for me to tell. Man visible on barge desperately clinging to its engine housing. 1054 Captain [Nelson] orders boat to take us to Navy Headquarters up the Bay. We place most of survivors in this boat off on a raft to make their way ashore. There are now in the boat: the Captain, Chief and First Mates, Chief, First and Second Assistant Engineers and an injured oil covered seaman, Mr Weinstein, Rhodes, Trumbur and myself. Plus numerous sextants, and chronometers and some of Captain's papers. Many boats and rafts about us. Much confusion. 1058 Boat rapidly filling with water. We signal Navy motor launch, transfer Rhodes, Trumbur, Second Assistant Engineer and Chief Mate. Rhodes instructed to get men together and report to Navy Headquarters. Motor boat continues on course. Injured man seems to be suffering. 1105 Condition of boat becomes more severe. Signal an invasion boat and transfer all instruments. All but First Mate and First Engineer transfer to this boat. Ship's motor boat placed in tow and continue on course. 1113 Come alongside USS Chester and disembark injured man. 1125 Arrive on shore at office of Cargo officer. Disembark. Nobody here seems anxious to do anything for us. Provide water upon being asked. I request transportation to search for the men. 1155 Transportation provided. We are taken as far as the medical center. 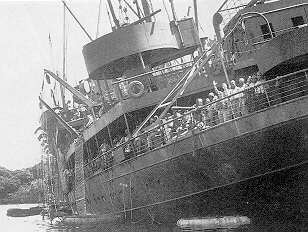 1230 Find two men of Communications Unit and [Seaman First Class Rufus] Warner of Armed Guard unit here at center. All uninjured. Hear that Rhodes has most of our men up the beach somewhere. Receive instructions to wait here for Captain of this base. Hundreds of oil covered naked survivors here. Kerosene broken out. They are cleaning up. Trucks taking them to River for further washing. Injured being given medical attention. 1330 Captain of base hasn't shown up so begin search for the men. Mr Weinstein and I obtain various rides up and down the road along the beach. Many false alarms since quite a few of the soldier survivors have been given sailors' uniforms to replace their oil soaked clothing. No trace of any more of my men. Continue search all afternoon. 1400 Report to Port Director. Instructed to round up my men and make report of muster. 1700 Meet up with Master [I think this is what it says - Captain Nelson] and some of ship's officers. Chow down [eat dinner] with them at CB [Construction Battalion] camp. Hear that my men and remainder of Communications unit are at 76th Coast Artillery Headquarters Camp. 1730 Arrive at 76th Coast Artillery Headquarters. Men are here. 1735 Muster men. Absentee; Wilson, Robert William, S 1/C [Seaman First Class] Armed Guard, USNR. He has been seen off the ship, however, so am sure that he is safe. Thank God all the boys are ok. Arrange for chow for the men at one of the kitchens here at this unit (a new outfit). 1745 Phone receiving ship and arrange for me to bunk down. 1800 Obtain two Army trucks to transport men to the receiving ship. 1830 Arrive at receiving ship. They are very nice to us but have very little. A few tents in a coconut grove which are already filled. They put up tarpaulins to sleep under. Get a few blankets and about 10 cots. Ensign Sickerman, the torpedo officer here, arranges cots and blankets in his tent from Mr Weinstein and myself. There is also another officer here - a survivor from a torpedoed destroyer. 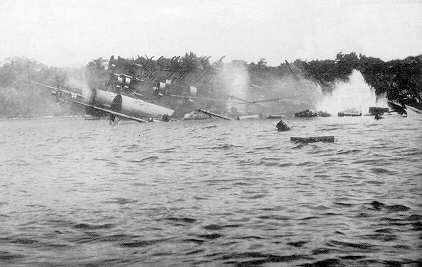 He was the engineering officer but managed to navigate a diesel launch here from the Solomons area with some of his men. Mr Weinstein and myself are all filthy, oil stained and tired. [The next entry is crossed out in diary] No mirrors but he tells me I am as dirty as the rest. 1845 Muster. Absentee; Wilson. Armed Guard and Communications units declared a unified command temporarily stationed at Advanced Base Button. Mr Weinstein appointed Executive Officer. 1930 Bunked down. No one takes long to get to sleep tonight. This island is Espirito Santo of the New Hebrides Group. It is medium sized and French owned. All the area that we have seen has been planted with coconuts. Trees evenly planted about 25 feet apart, grass in between. Coconuts now ripe and falling. You have to stay away from the trunks else you will be hit. Weather quite warm. Roads very dusty. All water bad except that distilled for drinking purposes. For diving the SS President Coolidge, I recommend the services of Aquamarine Diving, Santo.